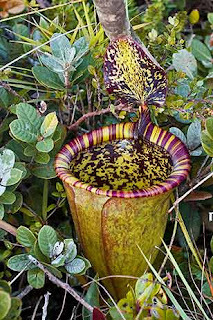 Home » botany , plants , science » Newly discovered pitcher plant eats rats! Newly discovered pitcher plant eats rats! Behold the Nepenthes attenboroughii: a pitcher plant found on the slopes of Mount Victoria in the central highlands of the Philippines. First spotted by a group of Christian missionaries who were attempting to reach the summit of Mount Victoria in 2000, a team of botanists confirmed the existence of the plant, which has been named in honor of British broadcaster and naturalist Richard Attenborough. Nepenthes attenboroughii boasts a monstrous-sized maw: big enough to drown and eat prey as big as a rat! Read more about it here at the BBC's website. Now if we could just find a plant to eat politicians. If I remember correctly, both of you are failed politicians. I won't speak for myself, but Eric Smith is anything but a politician. He is that rare breed that can only be called a "statesman". Honestly, Lee... I have no plans to run for office anymore. That could change 'course. I learned a long time ago to never say you'll never do something, 'cuz more often than not that just means that God is going to steer you into doing it anyway. But from the bottom of my heart: I am sick to death of politics. Enough so that I don't want to even think about running for anything like school board or anything local, at all.